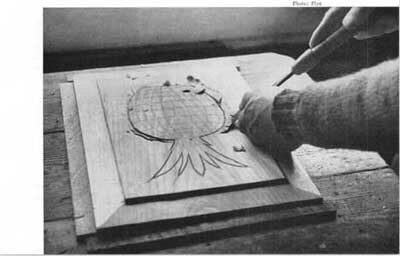 Anyone starting a new venture, such as wood carving, always start with a simple design. With this in mind, I have shown the various steps that can be followed to make a relatively simple carving; one that will call for certain skills in the use of both the carpenter's tools (a more fitting name would be the casemaker's tools) and the carving tools, as well. 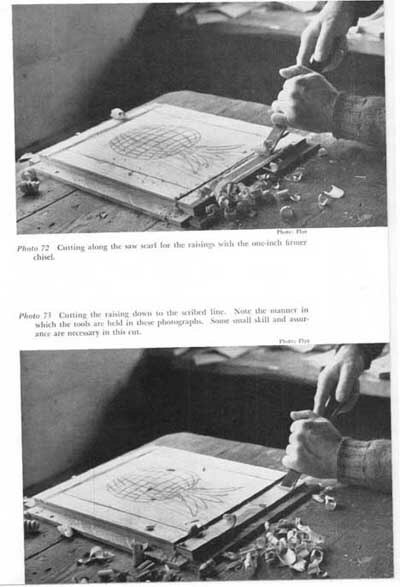 All the steps involved in this small problem are fully shown in the accompanying illustrations, from the layout of the design, the steps taken to make the design in plan and cross section, the method of transfer, the preparation of the carving block, the transfer of the design to the panel face, and all the succeeding steps necessary to complete the finished work. A description of these various steps follow in the order in which they are executed. First the drawing. The overall outline of the panel is drawn to full size. The outline of the panel raising is next drawn. The index lines are drawn. One half the design is roughly sketched in. The tracing off of this half is done next and then transferred to the opposite side. Before I go further, I should make this comment, I think. It has been my observation that in Nature there are no duplicates. No two sides of any natural object are exactly the same; no two apples are exactly alike, no two waves are ever the same. Nature is the vast storehouse of infinite variety. This being so, any representation of a natural object should have variants, as well. Back to our muttons. After the outline of the pineapple is traced off and the section lines are indicated, complete both halves of the drawing, varying the detail freely. These lines are indicative of what you want the finished carving to look like-only. They do not have to be followed exactly. The next step is to prepare the panel in cross section. Note this: all the following steps are done with hand tools only. Search out in your stockpile a piece of dry, white pine board about 11 inches wide by about 16 inches long. Be sure the stock is clear of knots, shakes, and sapstreaks. Lay out the actual overall size of the panelthat is, width 10¾ by 14¾ inches. Plane both edges down to the width dimension. Lay off its length and square the ends on the layout lines with the panel saw. Be sure that the ends are square-cut vertically, as well. (The panel saw is the fine-toothed crosscut saw.) Plane the surface of the panel with the grain to smooth the surface for the next step which is to lay out the raisings. 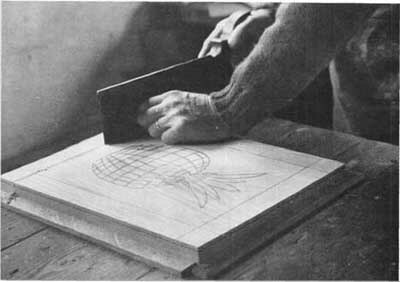 Using the backsaw (or tenoning saw), cut along the outline of the raising to a depth of ¼ inch, first across the grain at either end, then with the grain on either side (Image 71). Hold the panel in place on the bench top by means of two thin strips of wood nailed with brads to the bench top-the strips to go across one end and along one side. The best way to do this is to place the squared-up panel on the bench for guiding the position of these strips. Cutting along the outline of the raising. Note-the design has been transferred to the panel face. Use either one of two tools to carve out the stock between the extremes of the panel and the outline cuts; a one-inch firmer chisel or a one-inch skew chisel. I prefer the latter, though the former is just as good. These cuts should be made so that the cuts are first finished parallel with the face of the panel. The next step is to mark guide lines on the sides and ends of the panel to the depth to which the edging is to be finished according to your cross-section drawing. Always work with the grain of the piece when making cuts on the sides of the panel. Hold the chisel at a skew (an angle) to the end of the stock when cutting across the grain. Be sure that these cuts do not run into the sides or the ends of the raising. Using great care, finish off the edging cuts so that they slope from the raising to the edge of the stock and to the guide lines that you have drawn. If you use a firmer chisel, place the face of the tool against the stock for this purpose. This operation is difficult and tricky, but if care is taken to remove very little stock at a time, the results will please you. Be sure that the tool is always held at a skew in this process. The raising done, lay on the drawing of the pineapple. Be sure you have the inner corners of the raising indexed on your drawing and place these points over the corners of the raising. These will position the drawing on the center of the panel. Trace off. The next step is to make the stopcuts along the outline of the pineapple. Do this with a narrow skew chisel, holding the tool almost vertically with the face of the panel. Go along all the outline of the drawing. Don't try to outline all the terminal leaves at this point. Make your first cuts lightly. Follow this by increasing the depth of the cuts. Next, back-cut to the outline. I use a #14, 3/8-inch long bent gouge for this. 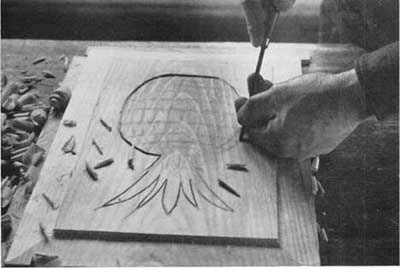 Repeat the process of outlining the carving until you have reached the depth of the carved pineapple you show in your cross section, that is, 3/32 inch. Bost out the stock between the outline and the raising edge. Try to leave a little stock here for finishing cuts. 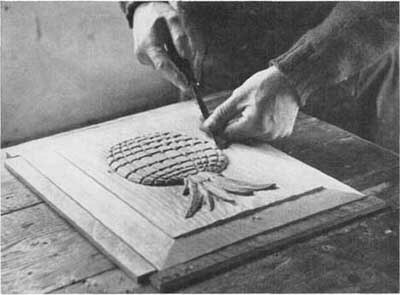 This will be the last portion of the carving to finish up, for this reason: as you work on the detail of the surface of the pineapple, the chances are that the edge or point of your tool will touch the bosted surface and, if this is finished before the face of the pineapple is done, you will have to remove these tool marks. Why repeat? Stopcutting along the outline o£ the design with the quarter-inch skew chisel. The raisings are completed. Backcutting to the stopcuts on the outline. Image 76 Modeling the leaves of the pineapple; the sections have been partially modeled out. The next step is to develop the leaves of the pineapple. Do this by lightly outlining them with the skew chisel. Using the /4-inch gouge, model the planes of these leaves so that they slope in various directions as they would in the actual fruit. 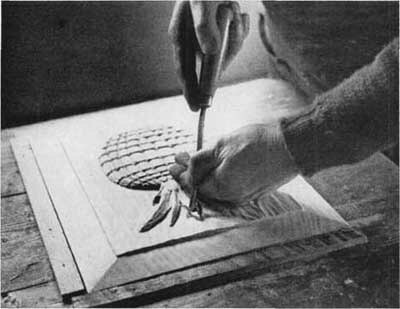 Don't forget you are making a bas-relief carving; therefore, all modeling will have to be lightly done. The effect of the rounding of the pineapple comes in the way in which the design has been made, not in modeling. After the leaves have been modeled, the next step is to carve and model the sections along the design lines. This is done, again, with the skew chisel in the manner shown. Make the cuts across the grain first, and then the cuts with the grain. Take care to see that your tool does not travel across the bosted section. After the section outline cuts are made, model the corners of the sections down into the outline cuts to give them the rounded effect you show in the drawing. Do this bit of modeling with the ½-inch gouge, with the face of the tool held against the face of the stock to be cut, that is, with the heel of the tool outward. This is a tricky business, but with care and patience it can be done. The final step in modeling the fruit is to model the edge of the pineapple. Do this with the gouge, again being careful to make light cuts and being sure that you do not cut too far into the face of the detailed fruit. This tends to soften the outline and make it seem to flow out of the panel rather than rise abruptly. 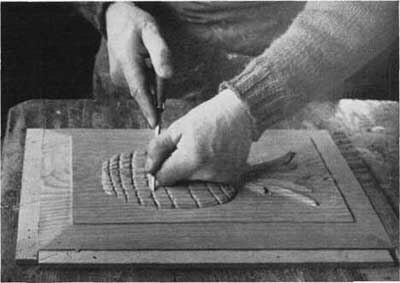 The last step in carving is to smooth off the bosted section. Here I suggest that you use a broad gouge for this purpose. Again light cuts will be more effective than heavier ones. Overlap the tool marks and use great care to avoid the edge of the pineapple. Any tool mark on that portion of the carving will be apt to spoil the outline because it will be necessary to carve the mark out if you want a finished piece. Finishing the modeling of the sections with the quarter-inch skew chisel. Modeling the edge of the pineapple with the #14, %-inch gouge. Having completed the carving, I would not sand any portion of the carved face. The edging can be sanded smooth, if you want. Now that the panel is done, don't ask me what to do with it. Hanging it up in the shop may be the answer. It is purely a practice piece or, if you are really ambitious, you can make a duplicate and mount them as end boards in a chest or in frames to be hung in some dark corner. My purpose in proposing this carving is that in its execution most of the tricks of the trade are used in the work. The pineapple motif is used very freely. Its significance in architecture is that it represents an hospitable welcome to guests. One of the illustrations shows a corner cupboard I made as a gift to my wife after I had sold a Welsh dresser out from under her heirloom collection of Chelsea china in an unguarded moment of enthusiasm. As you will see, the pineapple has been used freely, as well as rope molding and the lotus flower with the Ying and the Yang of the Chinese. Raised panels, such as the one under discussion, can be used in an infinite number of ways-for instance, as an over the mantel panel or as panels for a study. For such uses, it would be well to vary the bas-relief design on each panel to break up the similarity. In all cases in making bas-relief carvings, the shape of the object and the appearance of roundness and depth are developed in the way the piece is designed and in the faithful execution of the carving according to the drawing. This perspective business is a funny thing. If I were a better draftsman and knew more about it, I could tell you how to do it according to the book. I do it by trial and error. If it does not look the way I want it to the first time, I do it over until it does. In mezzo-relievo the development of perspective is a rather easier matter; in alto-relievo, quite simple. However, neither of these forms of carving is customarily used for raised panel work, except in rare instances, such as a panel that is to be placed at a point well above the eye of the beholder or where massive detail is used in all of the associated areas. The form of relief will depend upon these factors as well as upon the skill of the wood carver. I have included, in the illustrations of wood carvings that I have made in the past, pictures of a room in which several forms of carving and cabinet work are shown. These were taken in the living room of a house in South Bristol, Maine, owned by the late Glenn Stewart, who was one of the finest men I have ever had the pleasure of knowing. It was through his interest and that of Mrs. Stewart that I really got into the serious business of wood carving. The work shown in part took all of one winter to execute. All the work was done to my designs and I had pretty much of a free hand as to what I wanted to do. 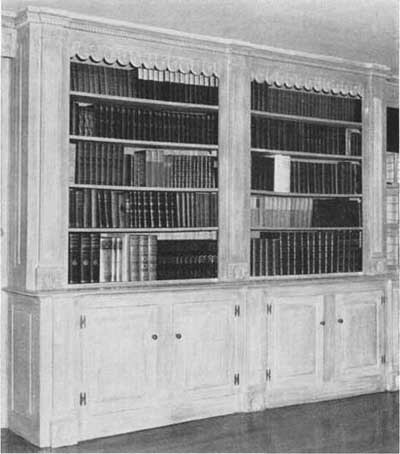 The bookcase is of some interest in that it has as decorative forms scallop shells carved in mezzo-relievo as well as intaglio. The flutings are done with a special tool called a "fluter," which is not too commonly found in a carver's chest. I hesitated to carve an elaboration on the scallop theme on the door panels and now I am glad that I did not do so. The valance boards are examples of plain panels made in the manner that is set forth in this chapter. 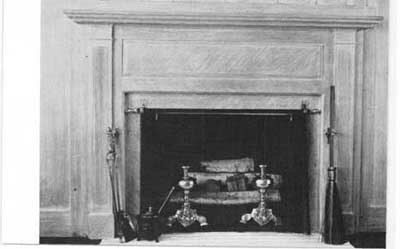 As a contrast to the bookcase, the fire frame and the mantel shelf are quite simple in design. These pictures show how wood carvings can be used as decorative architectural forms in a modern setting and how they can be used in conjunction with other decorative media to enhance the beauty of a room.